Filo pastry can be bought in all supermarkets now, yet it often gets forgotten about. You can usually find it in either the fresh or the frozen pastry sections. Next time you’re out shopping, pick some up – everyone should keep some at home because it’s wonderful to use as a base for sweet and savoury tarts, or to wrap around cheese or spiced meat fillings. It goes really crunchy when cooked, so it’s great with softer things. For this recipe, I’ve used it to make a quick open tart – perfect for a picnic or a simple lunch with a salad. You could even make individual ones and serve them as starters. Preheat the oven to 190°C/375°F/gas 5. Get an ovenproof dish – I’ve used many different shapes and sizes. Layer the sheets of filo pastry in the dish, brushing them with melted butter as you go and letting about 2.5cm hang over the edge. You want to get the pastry about five layers thick. Put a clean, damp tea towel over the top and put to one side. When the potatoes are done, mash them with the cheeses. In a separate bowl, mix together the eggs and cream and stir in your cheesy mashed potato. Grate in the nutmeg, season well with pepper and mix together. Spread the mashed potato over the filo pastry, then bring up the sides of the filo and scrunch them together to form a rim. 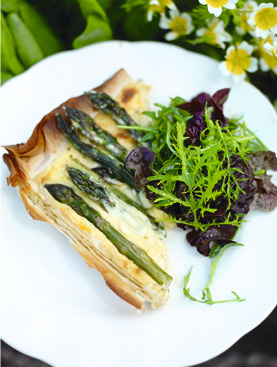 Take your blanched asparagus and line them up across the filling, making sure you cover it all. Brush all over with the remaining melted butter and pop into the preheated oven for around 20 minutes, or until golden and crisp. Allow to rest for 10 minutes. Serve just as you would a quiche for a quick lunch or supper, with a salad.